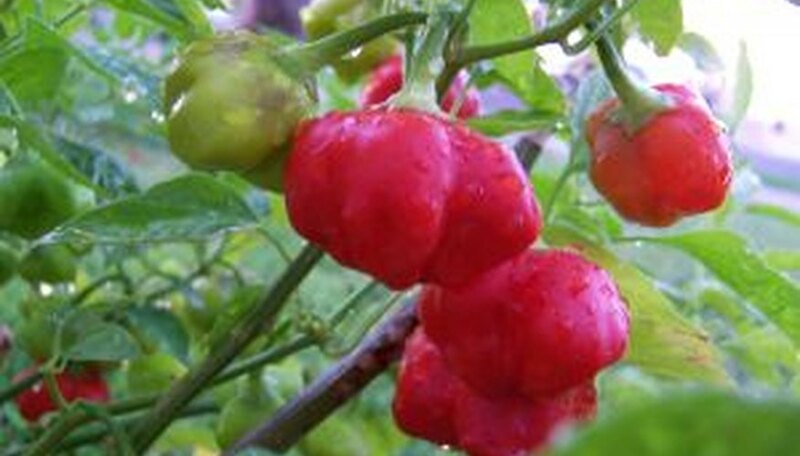 Pepper plants range from spicy chilis to tamer bells. Most are easy to grow and are well-suited to the novice vegetable gardener. In most regions peppers are started indoors in trays or pots before the winter frost has lifted, then transplanted into the garden three weeks after the last frost of the spring. Proper care while transplanting is important to avoid shock or damage to the plants and to ensure an ample crop. Harden off the pepper plants before transplanting them outdoors. Set them outside where they are protected from strong winds for two to four hours during the day. Gradually increase the time over the course of two weeks until the plants are outdoors for a full day. Choose a well-drained garden bed with full morning sun and partial evening sun. Work compost into the bed to improve drainage if necessary. Water the prospective bed and the pepper seedlings well the day before transplanting to loosen the soil. Transplant in the early evening or on a cloudy day. Direct sun too soon after transplanting burns the leaves and damages the plants. Dig holes deep enough to cover the entire root ball of the plant. Space the plants 15 inches apart. Grasp the plant by the stem near the soil line and pull it from the pot, soil and all. Loosen the soil around the roots with your fingers, then place the plant in the hole. Fill in around the plant with soil. Keep the soil moist during planting and thereafter. Avoid soggy soil--this will rot the roots. Apply 2 inches of organic mulch around the plants to retain moisture. Pepper plants grow best when their leaves touch neighboring peppers. Drive a stake in the ground behind each seedling so you are prepared when the plant grows and needs to be tied. Avoid planting two or more varieties of peppers close together, as they will cross-pollinate. Do not plant peppers in beds where eggplant, potatoes or tomatoes have been grown. This makes them prone to soil-borne disease.